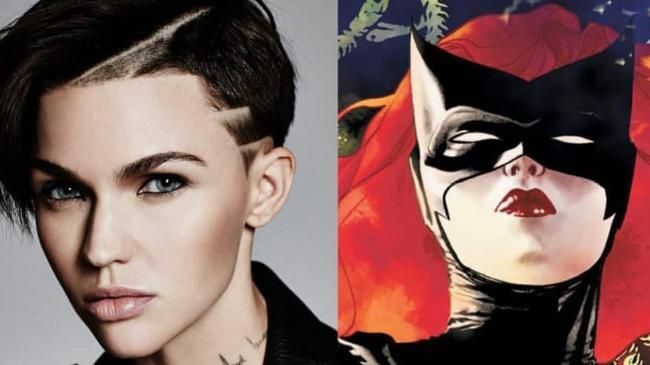 Ruby Rose and the character she will play, Batwoman. AUSTRALIAN actress Ruby Rose has deleted her Twitter account following backlash over the announcement that she'll play the first lesbian superhero to headline a TV show in Batwoman. As previously reported, The Meg star was recently cast as Batwoman (A.K.A. Kate Kane) in The CW's ongoing DC Comics TV universe. The star got emotional during an appearance on The Tonight Show Starring Jimmy Fallon when discussing the role and what it means for inclusion in Hollywood. "I feel like the reason I get so emotional, growing up watching TV, I never saw somebody on TV that I could identify with, let alone a superhero," Rose said through a cracking voice. "I have always had this saying - I mean, not me, Oscar Wilde - which is be yourself because everyone else is taken. So I always live by that motto, and the second motto when I came into the industry was be the person that you needed when you were younger. I feel like one motto led to another." However, it seems Rose has joined the likes of Stranger Things star Millie Bobby Brown and Star Wars: The Last Jedi actress Kelly Marie Tran in deleting social media accounts rather than withstanding the onslaught of negativity from online detractors. As Syfy notes, Rose's final tweet before shutting down her Twitter saw her lament the fact that people were saying she can't play a lesbian character because she is not a lesbian. Rose, however, has identified as a lesbian since she was a child. "Where on earth did 'Ruby is not a lesbian therefore she can't be batwoman' come from - has to be the funniest most ridiculous thing I've ever read. I came out at 12? And have for the past 5 years had to deal with 'she's too gay' how do y'all flip it like that? I didn't change," she reportedly tweeted prior to deleting her account. The star continues to have her Instagram account open, but has limited commenting to people she follows. Batwoman is still set to debut in December as a character during The CW's annual crossover event, which this year will include episodes of The Flash, Arrow and Supergirl. The bright knight: ADAM West, star of the 1960s television series Batman, has died at the age of 88.